Nancy Roberts, Co-Creator of Smart Cover Cosmetics has been helping hundreds of women, men and children learn how to cover all their skin imperfections by camouflaging them with makeup. Nancy is part the Roberts family who have been in the cosmetic business for over 30 years. And, Flori Roberts, (the Grandmompreneur) was the original creator of Dermablend Corrective Cosmetics. Nancy led the research to have cutting edge technology that would set Smart Cover apart from all other concealers, creating a simple, one-step process that could be used by people even with sensitive skin. She wanted the product to cover, correct, and be convenient for women, and men of all ages to use. 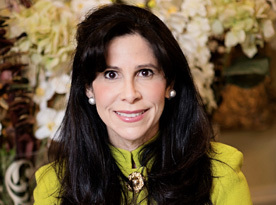 Nancy co-authored an article entitled Camouflage Cosmetics for the 21st Century that was published in the Association of Plastic Surgery Assistants (ASPA), and interacts with Dermatologists, Plastic Surgeons and other skincare professionals. Nancy currently acts as a consultant to international makeup artists on developing new cutting edge application techniques. You can see many before and after photos and hear many success stories with this product at www.smartcover.com. Nancy will be happy to answer any of your concealing concerns and send to you an on-line Gift Certificate so you can select your own shade. Just fill out the form below. Smart Cover presented makeup seminars at our recent 2018 VBF Conference and Clinic in New York, and has genersouly donated its services for many of VBF’s other NYC Conferences.